1. Etro cable-knit cotton cardigan, 2. Gant Rugger cable-knit cotton jumper, 3. S.N.S. Herning basket-knit cotton and merino wool cardigan, 4. Folk pima-cotton jumper, 5. Massimo Alba striped cotton jumper. After these two weeks of crazy cold, during which I've enjoyed wearing my new shearling jacket, it's time to start planning the new purchases for the Spring wardrobe. Despite my best efforts, I didn't manage to get many new jumpers this winter, so I need a few new ones now. I wear my leather jacket pretty much everyday in the Spring so I like mixing things up with cotton knitwear and lightweight scarves. 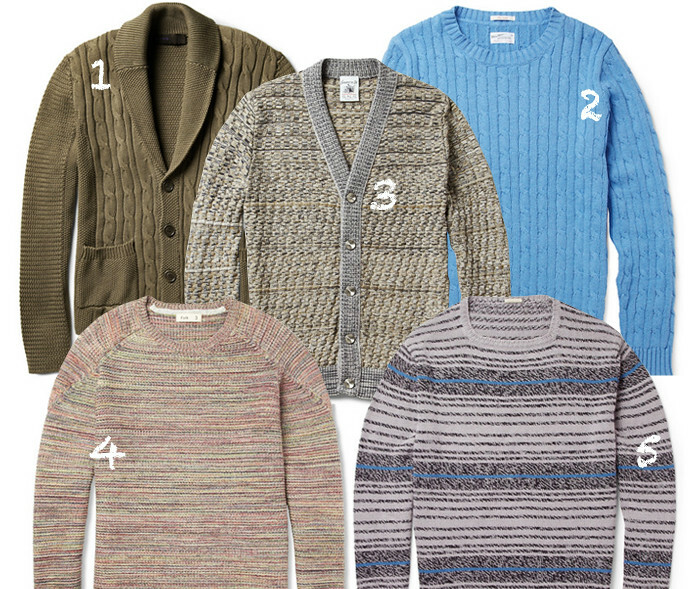 I am loving all the texture Mr Porter is offering this week – subtle colours and a quiet graphicness.